Mr Vegan's Neighborhood: Jar of Flowers: Edible Flowers And Salads In A Jar, The Touring Musician's Best Friend, Besides His Roadie! Jar of Flowers: Edible Flowers And Salads In A Jar, The Touring Musician's Best Friend, Besides His Roadie! With as many large green salads as I eat, sometimes it can be a struggle to keep them interesting. And when touring, it's especially hard to eat right when your tempted to dine out on the road. Salads are the last thing you'd think you could carry around with your gear, but hey, being a musician isn't just about being creative with your instrument! When I want to add a little excitement I always return to the same basic principles. 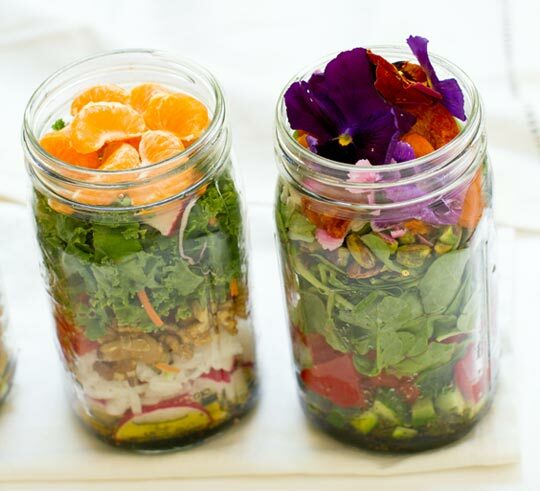 Vegan Salad-In-A-Jar keeps your salad fresh and crisp until ready to enjoy. To keep your washed, chopped lettuce extra fresh for an extended number of days in the refrigerator, pack it very tightly into wide-mouth glass jars. Although this site also recommends using a vacuum packing machine, I use no special equipment, and just manually stuff washed lettuce into the jar, filling with as much lettuce as will fit. I swear by this method and use it religiously. A fun way to create a "hearty lunch that's resolution approved and a joy to eat." 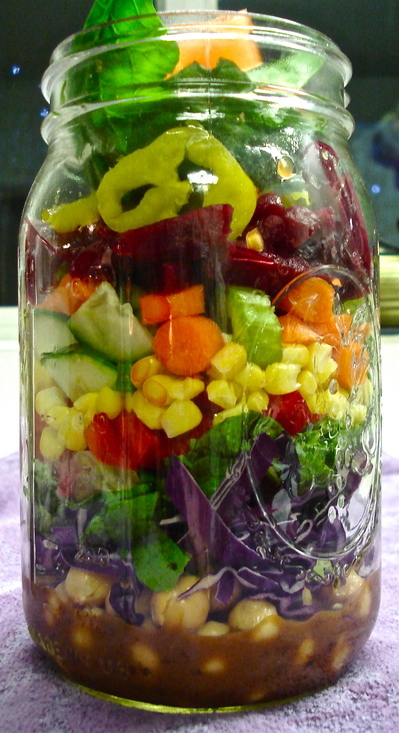 To build your own beautiful salad in a jar, start by pouring your favorite salad dressing into the bottom of the jar. Then add your most sturdy ingredients like baby kale, beans, or chopped carrots. Continue to layer with colorful lettuces, other chopped vegetables, and fruits or nuts. Top your salad with the lightest or most delicate ingredients. With infinite combinations, you can easily have a different, very colorful, crisp, and healthy salad every single day. There is nothing more important than eating right when your touring, Stay Beautiful and remember you are what you eat! Although these salad ingredients are suggestions, substitute freely with your colorful sliced, chopped, or diced favorites, layering in amounts that fill a quart-size jar. Pour salad dressing into the bottom of the jar. Layer the most sturdy salad ingredients into your jar. 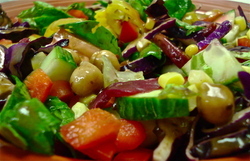 Next, add layers of lettuces and other colorful vegetables of your choice. Top your salad with the lightest and most delicate ingredients. Close jar tightly with lid. Important tip for salad making and eating: listen to excellent music!